Denbigh Castle stands on a rocky promontory above the small town of Denbigh and it is thought that the site of the castle was occupied as long ago as the early Christian period. It is possible that there was already a fortress on the site before the building of the current stone castle. 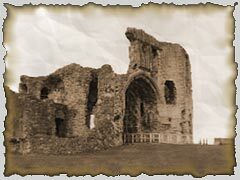 Dating from the late 13th or early 14th century, Denbigh Castle was apparently built by Henry de Lacy, 3rd Earl of Lincoln to whom King Edward I had granted the territory shortly after the last native Welsh prince had been defeated in 1282 AD. The original plans of the castle consisted of a long span of curtain walls which now form the town walls. Henry de Lacy, mentioned earlier, is said to have built the Goblin tower to protect the castle's water supply. One of the ghost stories from this castle relates that his son slipped and fell to his death from the tower and sometimes it is said that the boy's face can be seen looking out unhappily from a window. There have also been many sightings of a 'White Lady' around the castle. She has been seen to glide around the footpaths near the Goblin tower surrounded by a glowing white mist. Apparently, as recently as 1999 AD three youths were apparently terrified to encounter the 'White Lady' standing beneath the Goblin tower from where they said that she glided down the hill toward them.